This game was created for the purpose of W.A.G challenge with the theme of Down the Rabbit Hole. 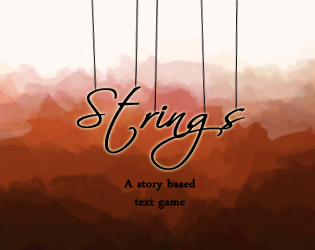 This is more a story-telling Text Game rather than a traditional Text Game with multiple endings. The story takes place in a not-too-distant future in an alternate reality where people with the ability to control other's minds emerged. Caught right in the middle of this feud between Humans and Puppeteers, your adventure begins! This was my first attempt at a game like this and I hope you enjoy it! Once downloaded in your folder, please click it for it to open a new window. If the new window shows bunch of texts clustered, try downloading it again and click it in your downloads folder. No programming or platform needed to play this.